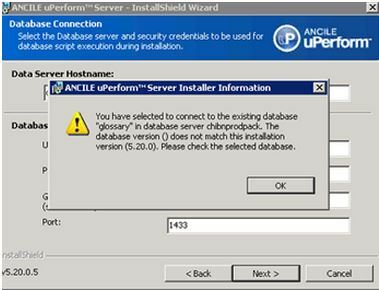 Have you ever run into this error during a uPerform installation or upgrade? You are not alone. This is one of the most common errors we see, so we thought we’d write a KB article about it. Go check it out: https://support.ancile.com/hc/en-us/articles/203658910 (log in required). In the meantime, we’d like to share a few preventative tips to help avoid this error. Option 1 – Connect to create a new Vignette Collaboration database: This option applies if you are performing a new installation. Option 2 – Connect to existing Vignette Collaboration database: This option applies if you are connecting to an existing, pre-populated database during an upgrade, have migrated your database, or if you are changing a current uPerform server installation to a new server and wish to connect to your existing database. Option 3 – I will configure my database later: Only use this option if you are instructed to do so by ANCILE in special cases.